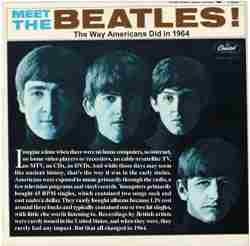 providing the American Perspective of the 1964 Capitol Albums! When I first became a Beatles-fanatic in the mid-‘70s, I was only aware of the American versions of their albums. Using the Beatles discography insert in the “red” and “blue” albums (“Beatles 1962-66” & “Beatles 1967-70”) I faithfully put a check my each album I purchased, hoping to complete my Beatles collection. But then, one day I visited a record store that had an “import” section – and saw a whole new slew of Beatles albums that I didn’t have. It was this moment I first became aware of the difference between the U.S. & U.K. versions of the albums! While some might complain that the new "The Capitol Albums Vol.1" CD set perpetuates the American “bastardizing” of the Beatles albums by releasing the first 4 American albums on CD, I actually welcome the set. Not only are they the albums that I grew up on, but now I have a chance to replace my well-worn vinyl copies with CD versions. Noted Beatles expert/author Bruce Spizer has made available a supplemental CD booklet to go along with the new Beatles CD box set available exclusively on his web site. For those who know Mr. Spizer’s work (you can’t call yourself a true Beatles fanatic if you aren’t! ), you are in for a treat. As the man who wrote the book (literally) on the Beatles relationship with Capitol Records, Spizer’s work is beyond compare. 498 Productions announces the publication of Bruce Spizer's special CD-sized booklet titled "Meet the Beatles the Way Americans Did in 1964". The 12-page full color booklet contains Bruce Spizer's essay written for "The Capitol Albums Vol.1," but not included due to insufficient time to obtain the approvals of "The Board." It provides the American slant to the package and compliments the official booklet. It is a Reader's Digest version of how Beatlemania evolved in America and how Americans were exposed to the music of the Beatles through the Capitol albums of 1964. It also contains release, mastering and sales information for each of the albums contained in the set. The booklet easily fits into the CD pocket or the booklet of "The Capitol Years; Vol. 1" CD box set, making it a great companion piece for the CD box set! The booklet is available exclusively through Bruce Spizer's website www.beatle.net at a cost of $3, which includes shipping and handling for U.S. orders.